Budtz Müller & Co. Artist of 1 portrait. 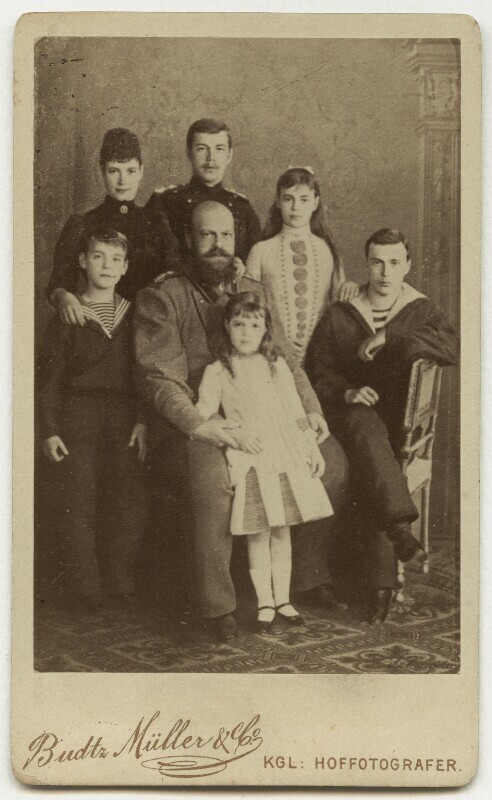 Alexander III, Emperor of Russia (1845-1894), Reigned 1881-94. Sitter in 11 portraits. George Alexandrovich, Grand Duke of Russia (1871-1899), Son of Alexander III, Emperor of Russia. Sitter in 2 portraits. Michael Alexandrovich, Grand Duke of Russia (1878-1918), Soldier; son of Alexander III, Emperor of Russia. Sitter in 3 portraits. Nicholas II, Emperor of Russia (1868-1918), Reigned 1894-1917. Sitter in 24 portraits. Olga Alexandrovna, Grand Duchess of Russia (1882-1960), Former wife of Peter Alexandrovich, Duke of Oldenburg, and later wife of Nikolai Alexandrovich Kulikovsky; daughter of Alexander III, Emperor of Russia. Sitter in 1 portrait. Xenia Alexandrovna, Grand Duchess of Russia (1875-1960), Wife of Alexander Mikhailovich, Grand Duke of Russia; eldest daughter of Alexander III, Emperor of Russia. Sitter in 2 portraits.